I saw this adorable idea on Pinterest and thought it was a perfect Spring time kids craft! It was easy to make, loads of fun to create, and of course yummy to eat! 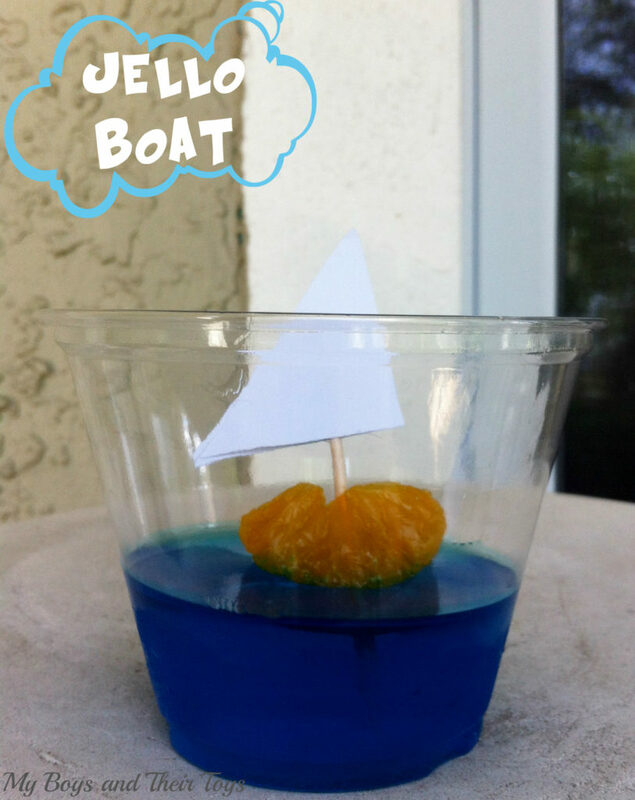 The Jello Boats would be a great idea for baby showers, party favors, school classrooms, etc. So simple and yet so cute! Youcould do this with pudding, too – vanilla with a bit of food coloring, or blueberry pudding! Very true! My son loved the jello cuz it “wiggled” lol. Oh how cute! My kids would love this. Adorable… my son would love that! ohhh this is good! so simple too! You are right, this would be great for a shower or party. The sails could have the kid’s name on it for a party, etc. I haven’t had jello in a long time. But I love that it can be made ahead, so refreshing for a hot summer day and keeps so well. Thanks for the idea. What a great idea! I can see this for Easter, Christmas, or what have you. And so nice that it can stored away in fridge, pre-made for when you need it. Pinned & Planned!